Widely regarded as the American Nobel Prizes, the Franklin Institute Awards are among the oldest and most prestigious comprehensive science and engineering award programs in the world. The Franklin Institute laureates for 2003 are Paul B. MacCready, internationally known as the "father of human- powered flight," who will receive the esteemed Bower Award for Achievement in Science and the accompanying $250,000 Cash Prize; and Herbert D. Kelleher, Co-founder and Chairman of the Board, Southwest Airlines Company, who will receive the Bower Award for Business Leadership. Bishnu Atal, John N. Bahcall, Raymond Davis, Jr., Jane Goodall, Robin Hochstrasser, Masatoshi Koshiba, John McCarthy, Norman Phillips, Joseph Smagorinsky, and Charles H. Thornton will receive the Benjamin Franklin Medal. "It is a privilege to serve as host of The Franklin Institute Awards and to honor these exceptional scientists for their dedication to science," said Matthews. "Through their accomplishments, they have inspired us and paved the way for future innovation in the generations to come." In addition to hosting "Hardball" and "The Chris Matthews Show," his NBC syndicated news program that airs at 10 a.m. on Sundays, he anchors election coverage on MSNBC. Matthews is the author of four books. "American - Beyond Our Grandest Notions" (2002), Matthew's latest book, may well be considered a window into his soul. The book describes the American belief in taking charge of one's destiny and the value of freedom of expression. "Who wouldn't want to be that person with the guts to stand alone against the corruption and cynicism of the powers to be?" he asks. These sentiments define the American spirit, Matthews says. Christopher John Matthews was born in 1945 into an Irish family in Nicetown, a row house neighborhood in North Philadelphia. "I think that growing up where and when I did explains my instinctive on-air connection between God and country, morality and politics. It's a good guy - bad guy game in which the good guys are forever endangered." Matthews graduated from La Salle College High School, where he developed his passion for writing, and then attended Holy Cross College. He served in the United States Peace Corps in Africa. Inspired by a visit to Washington in 1954 with his family and his mother's encouragement to dream, Matthews headed for Capitol Hill in 1971 and a future in politics and government. Initially employed by Senator Frank Moss of Utah, Matthews' experience over the next 15 years ranged from working as a legislative assistant to being a speechwriter for President Jimmy Carter. From 1981 to 1987, Matthews served as top aide to Speaker of the House Thomas (Tip) O'Neill, Jr. and then was a nationally syndicated columnist and Washington bureau chief for the San Francisco Examiner for 13 years. Matthews wrote his first book, "Hardball: How Politics is Played - Told by One Who Knows the Game," (1988) and covered seminal events such as the opening of the Berlin Wall, the first all-races election in South Africa, and the historic peace referendum in Northern Ireland and the Republic of Ireland. He wrote "Kennedy and Nixon" (1996), then immersed himself in the National Archives in 1997 and 1998, where he unearthed a series of scoops on the Nixon presidential tapes. 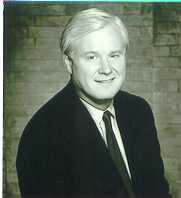 By the mid-1990s, Matthews' odyssey included television and "Hardball," a political talk show that is fun to do, he says, because it allows for open discourse and uninhibited debate. In 2000, he became national columnist for the San Francisco Chronicle and in 2001 wrote "Now Let Me Tell You What I Really Think" (2001), a book entwined with childhood memories from Philadelphia. In 2001, Matthews was named an honorary police commissioner and an honorary fire chief of Philadelphia. He is the recipient of the Lincoln Award from the Union League of Philadelphia and also has honorary PhDs from eight colleges and universities. Matthews is married to Kathleen Matthews, the award-winning news anchor for the ABC affiliate in Washington, D.C. The couple lives in Chevy Chase, Md. with their three children, Michael, Thomas, and Caroline. The Franklin Institute Awards Ceremony and Dinner is one of the nation's most historic awards programs. For 179 years, this Program has honored outstanding individuals who have transformed entire fields of knowledge through their scientific discoveries and technological innovations. Past laureates have included Alexander Graham Bell, Albert Einstein, Thomas Edison, Marie and Pierre Curie, Jacques Cousteau, Joan Ganz Cooney and the Wright Brothers. The Awards Program recognizes seminal contributions to scientific thought and progress in order to inspire appreciation for the power of science to broaden understanding, inspire lives, and encourage future innovation and discovery. Today, the Institute continues its dedication to public education and sharing Franklin's passion for science through its museum, outreach programs, and curatorial work. Recognizing outstanding achievements in science throughout the world is one important way that the Institute perseveres in its commitment to Franklin's legacy. The 2003 Franklin Institute Awards Ceremony is generously presented by Fleet Private Clients Group, whose sponsorship helps to underwrite the extraordinary costs associated with staging this event. The Ceremony, which will be attended by more than 700 business, civic, government, and education leaders from the Greater Philadelphia Area, provides funds for free or discounted admissions for the 300,000 schoolchildren who annually visit the science museum. Associate Sponsors for this event include Centocor, Inc.; Cephalon, Inc.; Endo Pharmaceuticals, Inc.; and the Four Seasons Hotel. In addition, Cephalon, Inc. will underwrite a series of ten Laureates' Symposia, to be held at local universities, and the Meet the Scientists Program, wherein high school students participate in a question and answer session with the laureates. For more information on the 2003 Franklin Institute Awards Program and for laureate information or to arrange interviews, please contact Evan Welsh at The Franklin Institute at 215.448.1176 or check the Institute's web site at http://www.fi.edu. 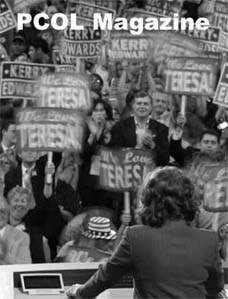 Teresa Heinz Kerry celebrates the Peace Corps Volunteer as one of the best faces America has ever projected in a speech to the Democratic Convention. The National Review disagreed and said that Heinz's celebration of the PCV was "truly offensive." What's your opinion and who can come up with the funniest caption for our Current Events Funny? Exclusive: Director Vasquez speaks out in an op-ed published exclusively on the web by Peace Corps Online saying the Dayton Daily News' portrayal of Peace Corps "doesn't jibe with facts." In other news, the NPCA makes the case for improving governance and explains the challenges facing the organization, RPCV Bob Shaconis says Peace Corps has been a "sacred cow", RPCV Shaun McNally picks up support for his Aug 10 primary and has a plan to win in Connecticut, and the movie "Open Water" based on the negligent deaths of two RPCVs in Australia opens August 6. Op-ed's by RPCVs: Cops of the World is not a good goal and Peace Corps must emphasize community development.